Never taste or use any wild plants unless you are sure you know their identity. 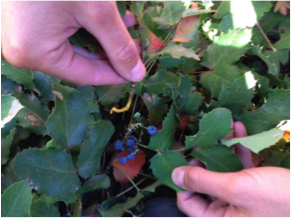 Harvest them sustainably with people who know the plants and double check their identity with multiple field guides and botanical keys. Most medicinal plants can be made into teas and tinctures (alcohol extractions). However, ask a knowledgable herbalist or physician before consuming any plant medicine. It is a low growing evergreen shrub in the Barberry family (Berberidaceae) with dark green pinnately compound leaves consisting of 5-9 spiny leaflets. The leaves turn bright red in the fall. The leathery leaves resemble holly and the stems and twigs have a thickened, corky appearance with a bright yellow color on the underside of the bark. The flowers, borne in dense clusters in late spring, are yellow, and are followed by spherical dark dusty blue berries in the summer. This plant is very medicinal. The yellow layer on the inside of its root bark is due to a component called berberine. This yellow inner bark is antimicrobial (against bacteria, virus and fungi) as well as very bitter. It can be chewed up and swallowed or a tea made and put in unpurified water in a wilderness emergency. The Hopi, Paiute, Navajo, Shoshoni, Blackfoot, Cheyenne, Mendocino, and other tribes also used the plant for medicinal, food, and ceremonial needs. Native Americans also used the wood of the stem to produce yellow dyes. 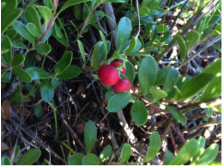 The berries are edible and used to make jellies. Its yellow flowers are edible and contain Vitamin C.
This lichen in the family Parmeliaceae often grows on coniferous tree branches and stumps all over the world, especially in moist environments and even in certain parts of dry montane forests. When it is broken apart, a thin white stretchy thread can be seen inside. It is very antifungal and somewhat antibacterial as well. It is used in respiratory, urinary and fungal infections. It can be dried and crushed into a powder or put in creams to be used for “athlete’s foot”. The sticky budding tops of this plant in the Aster (Asteraceae) family are used just as the yellow flowers are blooming late summer or early fall. It is an excellent expectorant, which means it will help loosen up a cough with phlegm. It is best used in tincture (alcohol extract) form due to the high resin content. It can also be made into a topical preparation for poison ivy or poison oak. Yarrow is in the Aster (Asteraceae) family. It can have white or pink flowers in the summer and is most obviously distinguished by its many tiny segments on its leaves, hence one of its species name millefolium in Latin. 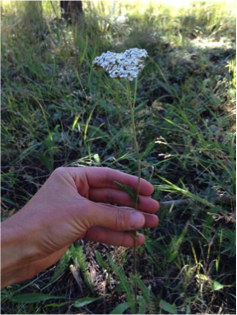 Yarrow grows in disturbed areas of soil at many different elevations and climates. It is an excellent first aid remedy, most notably antimicrobial, diaphoretic (helps induce fever), styptic (stops bleeding) and regulates the inflammatory process. It can be chewed up (spit poultice) and used topically to heal wounds, stuffed inside the nose to stop a nosebleed and helps internally with infections and pain due to inflammation. Its bitter taste stimulates digestion and can be used for indigestion if the flavor is not masked. This plant is not to be used in pregnancy and can cause an allergic rash in individuals with allergies to this plant family. Also, there are many horticultural varieties and hybrids that have no medicinal effect. Trees in this Willow family (Salicaceae) contain salicin in their bark, which is metabolized by the body to salicylic acid, which is similar to the active ingredient in aspirin (also known as acetylsalicylic acid). This compound is anti-inflammatory, analgesic (acts to relieve pain) and slightly sedative. Thus, the bark can be used to treat rheumatic complains, as a pain reliever and a fever reducer. The bark has also been used for diarrhea and parasites. The thin white powder found on the outside of the bark has some ability to block the ultraviolet rays of the sun and some Native Americans used it as a sunscreen. In the spring, the inner bark is sweet and Native Americans ate it as a treat. They also used the wood for paddles and bowls. Elk, deer and beavers eat this tree. This thorny shrub produces a showy flower with 5 petals in the early summer. In the fall clusters of red rose hips (about 6-12 mm in diameter) are produced and are edible, a high source of Vitamin C. They also contain Vitamins A, B, E and K. Scoop out the seeds and eat the outer berry as the seeds have small hairs that can cause itching when passed in stool. This low growing evergreen shrub in the Heather family (Ericaceae) is related to the manzanitas that grow all over California. The leaves are antiseptic to the urinary tract as well as a diuretic. Therefore they are used medicinally for urinary tract infections by causing decreased bacterial adherence to the lining of the bladder. Due to the tannins it contains, this plant should not be used long-term , only up to 7 days. Its red berries are edible and ripe in the summer but are dry and tasteless. Too many can cause constipation. This plant is not to be taken in pregnancy. The insides of the pink fruits become ripe in the fall after the flowers fall off and are edible with a banana like flavor and a grape like texture. They contain vitamin C and magnesium. 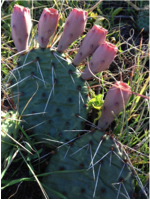 Native Americans used the flesh inside the cactus to soothe burns and wounds. The cacti can be put in a fire to burn off the spines in order to access the insides. This biennial in the Figwort family (Scropulariaceae) grows a basal rosette of large, soft leaves in its first year, a tall stalk of small, yellow flowers in the summer of its second year and then dies in the fall. The leaves are mucilaginous which means they are soothing to mucus membranes such as the throat and lungs. They are also calming and anti-inflammatory and are used internally for colds, bronchitis, asthma and kidney infections. Leaves are also smoked for spasmodic coughs. They have also been used topically in poultices for ulcers, tumors and hemorrhoids. The roots can be used for incontinence and bed wetting and the flowers are used in topical oils mixed with garlic for simple ear infections. If prepared as a tea, it should be filtered to remove the fine hairs on the leaves. The dried stalks from the year before are sturdy on the outside and pithy like foam on the inside. They make a good spindle for a bow drill. 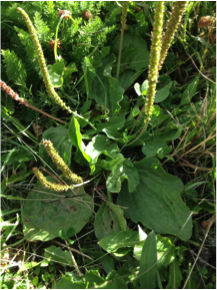 Plantain grows on foot paths and in yards all over the United States. Its leaves contain Vitamins A, C and K and can be used topically in a poultice to soothe and heal sunburn and wounds. Its seed was ground by some Native Americans to use as flour. The sap of this pine tree has been used historically by many Native Americans. Salves can be made from it and used topically for boils, abscesses, rheumatism and back aches. The sap was also used to waterproof containers and chewed as gum. This coniferous low growing shrub in the Cypress family (Cupressaceae) is the only circumpolar conifer in the northern hemisphere. It is diecious, having the male and female sexual organs on separate plants. The female Junipers have small bluish-green, round berry like cones. These “berries” are used for urinary tract infections and flavoring gin. They are not to be used in pregnancy or if a person has kidney problems. The Rocky Mountain Juniper is a very similar but taller, upright growing version of this plant. Dandelion – leaves, roots and flowers edible. Yellow Stonecrop – water storing succulent leaves. Most, but not all, species are edible and high in Vitamin C.